Thank you for your support and positivity on Friday. You’re such a great bunch ;) I’m so pumped to start this next chapter in my life and share my experiences with all of you. Knowing that there’s only 100 days between me and the first day of the rest of my life is so exciting. Come Friday I was ready to celebrate! Growing up, pizza always marked a celebration of some sort. A friend’s birthday, the end to a busy week, Mom leaving the house to my Dad, littler sister and I. Whenever there was pizza, there was a party! Any guesses on what we had Friday night to ring in the changes? Pizza! 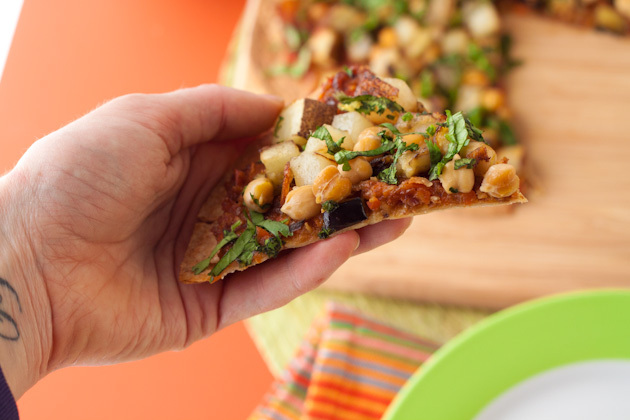 But not just any pizza, this baby was loaded with Indian inspired ingredients and a sweet and savory masala sauce. Curry on a pizza. My life is complete. 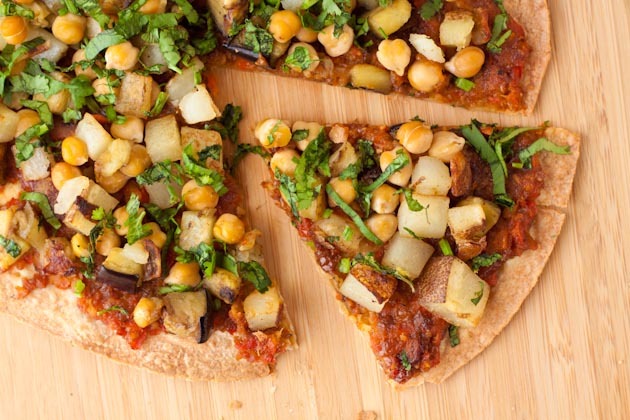 Sweet and spicy vegan pizza with tikki masala sauce, roasted potatoes, eggplant, chickpeas and cilantro. 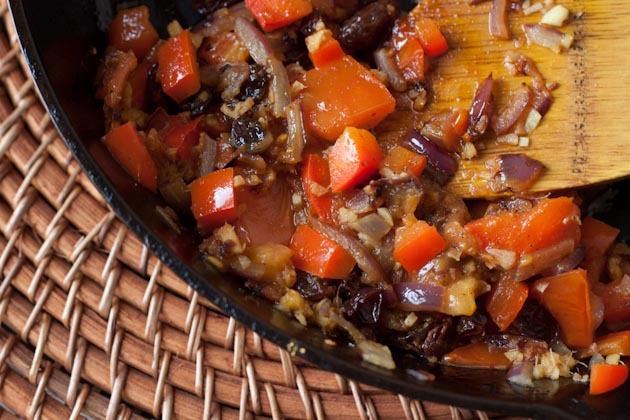 To make the sauce, melt coconut oil in a small cast iron pan on medium-high heat. Drop in onions, red pepper, garlic and ginger. Saute for 2-3 minutes, or until slightly browned. 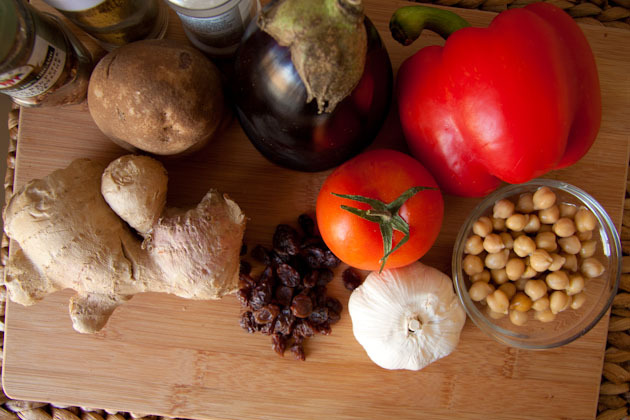 Add tomato and raisins and continue cooking for another 2-3 minutes. Drop mixture into a food processor or blender with water and spices. Pulse a couple of times, but not too much as you want the sauce to be a bit chunky. Set aside. Meanwhile, in a second cast iron, heat coconut oil. Add potatoes, place a lid over top and cook on medium-low heat for 10 minutes. Add eggplant and salt, cover and cook for another 5 minutes. Set aside. Preheat oven to 400 F. Grease a baking sheet or pizza pan with a dab of coconut oil and place tortilla over top. 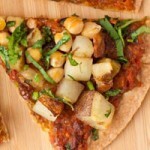 Spread tortilla with sauce and top with potato mixture, chickpeas, half of the cilantro and dairy-free cheese if using. Bake for 8-10 minutes or until sides begin to golden. Remove from the oven, sprinkle with leftover cilantro and serve. I began with a bunch of odds and ends. Half a potato, leftover chickpeas, and 3/4 of a red pepper. 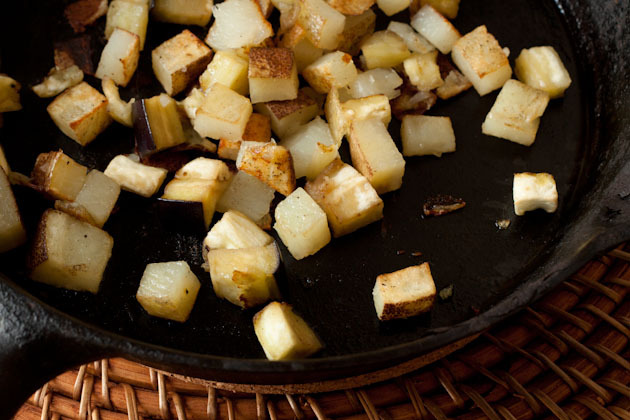 Emeril Lagasse’s recipe for hash browns has me addicted to roasting potatoes in my cast iron so it was a no brainer on how I was going to prep the potatoes for this pizza! Generally you’d add a bit of sugar to the sauce to soften the acidity of the tomatoes but I opted for raisins to give some of the sweetness. When I blended the sauce, I kept it a bit chunky so there were bits of raisins throughout. 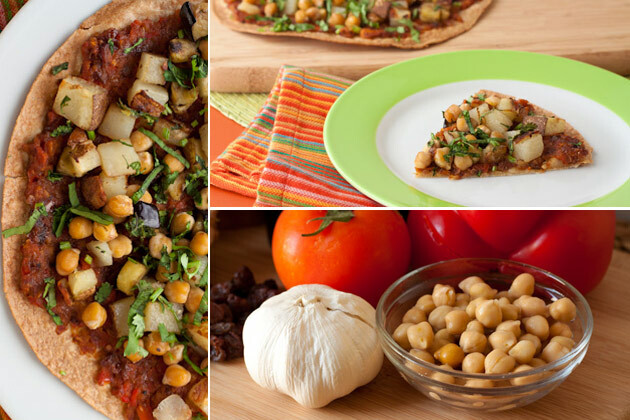 Assembling the pizza was as easy as 1,2,3.. 4 and 5. But step 1 isn’t even a step, and 2 and 3 are practically the same. But it looks good, right? 10 minutes in the oven, and Bob’s your uncle! 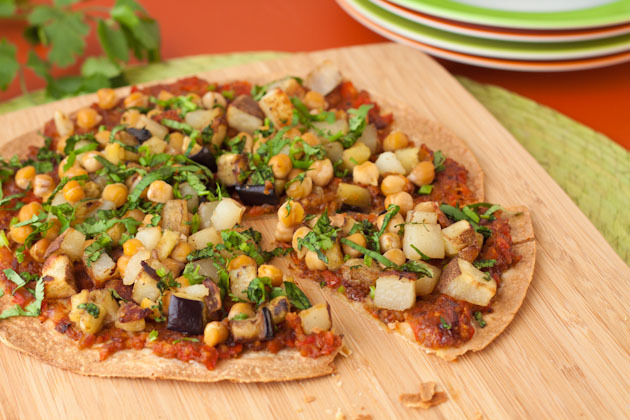 The trick to using the brown rice tortillas as a pizza crust is in the crispness of the crust and the consistency of the ingredients. Had I steamed the potatoes or used fresh tomatoes, it totally would have fallen apart. If you don’t have tortillas, no worries. Any crust will do the trick. 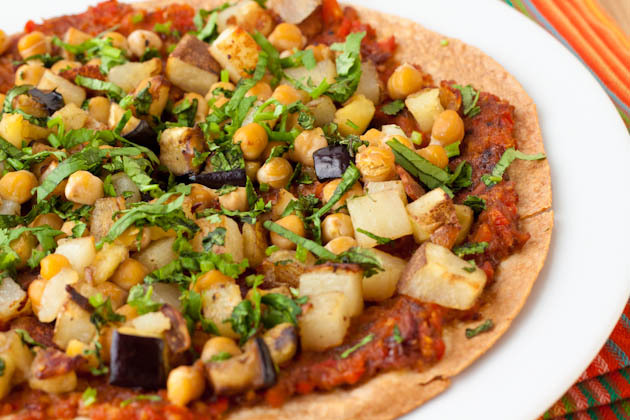 If you’re feeling a bit crazy, you could also try using a gluten-free naan as the base. I was going to try it until I realized I’d eaten the last naan for breakfast on Friday morning. Hey, who said naan wasn’t a breakfast food? Throw some sunflower butter on there and you’re good to go!